As a yoga practitioner, it is important to be able to discern the difference between good pain and bad pain. Part of the human experience is to feel natural discomfort within the body. The way that we exercise muscle is different from the way that we exercise connective tissue. If you want to strengthen a muscle such as a biceps, then you stress it by doing repetitive, strong, and explosive movements. A Journey Into Yin Yoga explores the origins and application of this popular, passive style of yoga. Learn the poses, breathing, and meditation techniques that have helped millions strengthen body, mind, and spirit. If you are a member of the HK Rewards Program,when pre-ordering a new print edition of this book, you will be granted the option for downloading the e-book edition at no additional charge when it becomes available. Learn more. Join world-renowned yoga instructor Travis Eliot as he guides you through this contemporary and effective approach for strengthening your mind, body, and spirit. You will learn about the origins and practice of yin yoga, a passive approach in which poses are held for a few minutes to target the connective tissues of the hips, pelvis, and lower spine. You will slowly and mindfully transition between poses as you gently allow those tissues to stretch, facilitating better circulation and joint health and improving flexibility. Throughout, you will learn the benefits, contraindications, alignment points, and modifications so you can adjust the poses to your needs and body type. Eliot also explains eight breathing techniques and eight meditation practices for improved focus, reduced stress, and enhanced clarity. Ten ready-to-use sequences allow you to target specific goals, including better sleep, spine flexibility, and healthy hips, knees, and shoulders. A Journey Into Yin Yoga presents 46 yin yoga poses with stunning photos and detailed instruction, along with inspiring quotes, stories, and interviews from celebrities, doctors, and athletes. You will be inspired to discover your unique path to improved mental and physical strength and balance. CE exam available! For certified professionals, a companion continuing education exam can be completed after reading this book. A Journey Into Yin Yoga Online CE Exam may be purchased separately or as part of the A Journey Into Yin Yoga With CE Exam package, which includes both the book and the exam. Travis Eliot is a world-renowned yoga instructor, meditation teacher, kirtan musician, and certified Ayurveda practitioner. He is the CEO of Inner Domain Media, director of Holistic Yoga Flow teacher trainings, and a member of the faculty of the prestigious Kripalu Center and the 1440 Multiversity. He teaches his signature holistic yoga flow classes in Los Angeles and in workshops and retreats around the world with an intensely dynamic style that has inspired many of today's top athletes, celebrities, and entertainers. Eliot is the creator of the groundbreaking DVD series The Ultimate Yogi and the cocreator of the digital series Yoga 30 for 30, along with many other best-selling yoga DVDs. 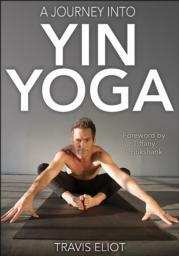 He is the coauthor of a comprehensive modern-day yoga book, Holistic Yoga Flow: The Path of Practice. His highly acclaimed chant album, The Meaning of Soul, debuted at number three on the iTunes world music chart. A Yoga Alliance–certified E-RYT 500 instructor, Eliot has been featured in Yoga Journal, LA Yoga, Ayurveda and Health, Mantra, Conscious Lifestyle, Asana Journal, Self, Fitness Trainer, Access Hollywood, and the Huffington Post.